Athletic Director and defensive coordinator Tad Dubose celebrates a 3rd straight state title. oach Jamie Nickles, choking back tears with five or six television cameras in his face, described his team as having a “heart of a champion”. No truer words have been said. Staring at a 7-0 deficit, after giving up a punt return for a touchdown, late in the fourth quarter, the Panthers decided that their season was not over, and they were not going out in any other way, than a champion. The Panthers found a way to get speedster Ja’Bryan “Dooley” Sanders the ball on a reverse and flipped the field position, on their way to the first offensive touchdown of the game. A fumbled kickoff recovery on the ensuing kickoff, followed by a 26 yard sprint by Junior Rapley for a touchdown, put the game away. The Bamberg defense grabbed all of the headlines leading into the game. Only allowing 79 points for the entire season, they were without a doubt the best defense the Panthers had to play all season. However, the Panther defense overshadowed the Red Raider defenders in Friday’s Championship bout. The Panther defense allowed only 89 total yards and pitched a shutout. 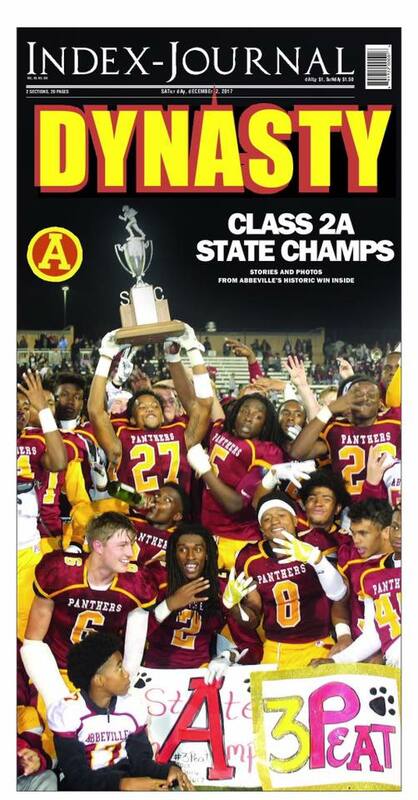 By a 14-7 score, the seniors on this 100th season of Panther football etched their name in the history books by becoming the first class at AHS to ever win three straight State Championships. The numbers that this class has put together is staggering. 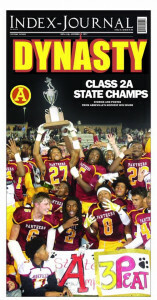 Through their three year state championship run, the Panthers have collected a 40-3-1 overall record. The Panthers have not lost to another AA team since a loss to Strom Thurmond in 2015. This group of Panthers have also won 15 straight playoff games, again another school record. They have defended their home field as well. The last time that the scoreboard in Hite Stadium didn’t reflect a Panther win was October 17th 2014. That’s a streak of 26 consecutive home games without a loss. ers now have NINE Football State Championships which ranks them 3rd all-time in the state regardless of classification. Only Byrnes(11) and Lake View (10) have more championships. The Panthers won their 25th Region Championship this season, which ranks them 5th all-time in the state and the Panthers finished with a 14-1 overall record giving them their 28th 10+ win season, which is good enough for 2nd most all-time in the state. 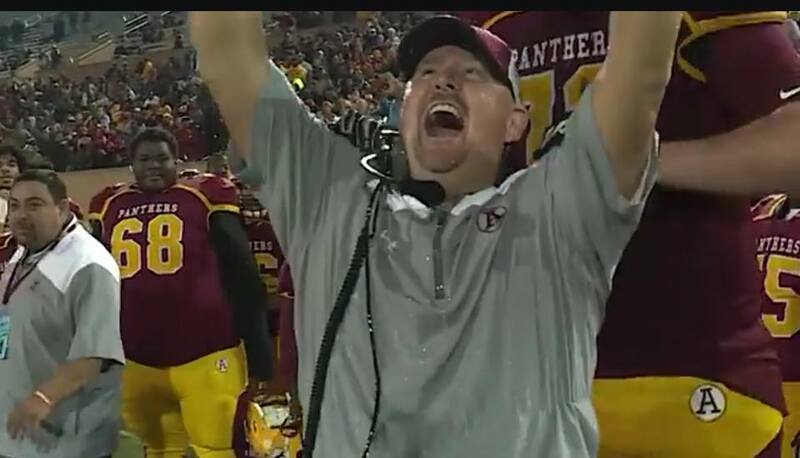 Head Coach Jamie Nickles won his 5th State Championship as head coach of the Panthers. The win ties Nickles with Hall of Famer, the late Dennis Botts with 147 wins, the most in school history. The win also moved Nickles into a 4th place tie in all-time state title wins in the history of South Carolina High School Football. One word can sum up the state of the Panther program. The Panthers, as you can see have been rich in history and tradition for many years. 100 to be exact. This group of seniors upheld the winning tradition of Abbeville football, and raised the bar to a new level of expectation. It’s been a pleasure covering this fine group of young men and coaches all season long. It’s sad to see this journey come to an end, but what a way to go out. Back to Back to Back State Champions has a nice ring to it. We are only 256 days until we kickoff the 2018 season, Week Zero at Lincoln County and begin the march for that pinky ring.